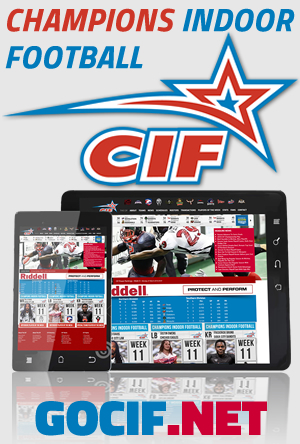 THE 2018 CIF RULEBOOK CAN BE DOWNLOADED HERE! 50 yards long by 28 yards wide with endzones eight yards deep, surrounded by four feet high padded walls or dasher boards. Ten feet wide, ten feet off the ground, generally suspended from the ceiling. Eight players from each team on the field at one time. Each team can have up to 24 players on the roster. Each team can have up to 22 players active for each game. Players must be at least 18 years of age at the time of signing. Three linemen must line up on the line of scrimmage. One coach is allowed on the field from each team. Four quarters, 15 minutes each.The offense has to make forward yardage in the last 60 seconds of each half for the clock to keep running, if forward yardage is not obtained the clock stops. Ball is kicked from any point along the goal line. If a kickoff hits the ceiling or goes out of bounds through the endzone or sideline before touching the ground, it comes out to the 25 yard line. Should a kickoff hit the back wall of the endzone or bounce over the back wall of the endzone, it is considered a touchback and the drive starts at the 5-yard line. No punting is allowed. The offense must either attempt to convert the fourth down or kick a field goal. The wall itself is an extension of the ground. If a pass hits the wall or ground, it is ruled dead. If the ball or a player goes over the wall, they are considered out of bounds. During the final 90 seconds of each half, a player can give themselves up intentionally to stop the clock by purposely contacting the wall and holding the ball over the wall with arms extended. One player may blitz; he must be lined up five yards from the line of scrimmage and be stationary. The blitzing player must identify himself, stay between the defensive ends, and is not allowed to blitz around the outside of the defensive line.